Home clearings involve many aspects to help shift the energy dynamic within. First we discuss how you have been feeling in your home, any concerns and intentions you have, what you would like to invoke and bring in. Then I take a tour of your home. During this time I am noticing which of the 4 elements feel prominent in your space, pick up on energies present, become aware of areas that may need special attention and simply seeing every room, attic, basement etc so none are missed. If your family is wanting to include a Medicine Bundle, you will be sent to collect the items needed while I begin. After this, you are free to hold sacred space, leave, or tend to something quietly wherever you are most comfortable. I will go outside, sain, ground, and set sacred space for the work. There I will make offerings and journey to the Spirit of the Land that you live on. I will introduce you to the land and spirit(s), state your intention for being there, and ask what tending needs to be done to bring balance. You may be given instructions such as building a shrine, replacing something removed, guidance to not cut a certain tree, or to plant certain plants or to make regular offerings. Inside begins with various helping plants such as sage, palo santo, fomitopsis pinicola, lavender, rowan, sweetgrass being called upon to bring their clearing medicines to your space. Extra attention is given in every room to electrical outlets, drains, toilets, furniture and stagnant space areas. I will be in a semi journey state to receive communications such as any possible psychopomp, spirits or soul parts that may need traditional shamanic service to remedy as well as allowing any Blessings to come through from Spirit. Blessings will be spoken in your home, then written out for you to let settle or continue to work with. Various sound vibration healing, as well as calling on helping spirits will help shift the energy, bring balance and anchor the work. 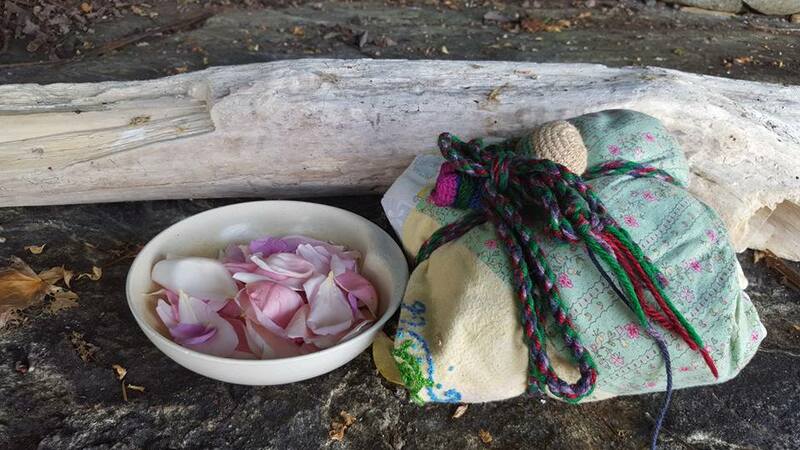 If your family has chosen to incorporate a medicine bundle into this ceremony, you will have been asked to gather specific items while I was working. I will also bring some supporting items. This bundle is created with physical representations of your intentions, blessings and wishes for your home. When we have created this, we will find a place for it to nest and radiate its medicine. This may be near your threshold, in your basement, rafters, buried or right into the foundation or walls of your home. This is a beautiful, interactive, family oriented aspect that you may wish to include. I will share with you the story of the journey to the land, and any information I have gleaned along the way to help further bring balance, light, and a peaceful energy to your home-space. You are encouraged to set your cell phone to audio record this story. Ideally tending to the land is done before any building begins, prior to occupation or use, but this is not always the way things unfold - and that is okay. Tending to the land is all about respect and communication, it is establishing a relationship between you and where are. I will go to the land, make offerings, smudge, ground, and set sacred space for the work. A journey to the Spirit of the Land will be done where first, I listen and witness what messages we need to know. I will introduce you to the land and spirit(s), state your intention for being there, and ask what tending needs to be done to bring honour and balance. You are likely to be given instructions such as building a shrine, replacing something removed, guidance to not cut a certain tree, or to plant certain plants or to make regular offerings. I will facilitate any traditional shamanic service or other spirit realm balancing that might be called for. The story of the journey is shared with you. If negotiations are needed I will do a second journey, share your plight and see what mediation can happen. From here you take over this ongoing relationship you have with the land. It is your responsibility to carefully follow through with any guidance being given to you. House Clearing & Land Tending is $150 per hour, plus travel expenses if applicable. Most homes plus property are 2 hours. With a co-created medicine bundle assume 3 hours.